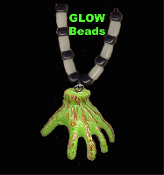 Huge Slime Green Bloody Walkers ZOMBIE HAND AMULET PENDANT NECKLACE - Halloween Frankenstein Monster Toy Ghoul Hands - Spooky Gothic The Walking Dead Charm Costume Jewelry for any THING Collector! Colorful Plastic, dimensional, detailed fingers. Scary, Creepy, Crawling, Severed Body Parts. Great to wear to a Haunted House! Approx. 1.5-inch (3.75cm) Diameter Charm, on 24-inch (60cm) Black satin rattail neck cord, with colorful acrylic beads mixed with translucent opaque Glow-inthe-Dark beads. Choose your bead and cord color! (Glow beads will be alternated with your color choice) *Please Note: We will send bead, cord color and length as described, if no options are chosen.